What Formstack Triggers and Actions are Supported? New Submission - Triggers when a new added submission for a form is submitted. Uses webhooks for instant triggering. New Form - Triggers when a new form is added. Create Submission - Creates a submission for a form in FormStack. The first thing you'll need to do to get started with hooking up Formstack with Zapier and hundreds of other services is to add your Formstack Account to Zapier. Click to add a Formstack account in your Zap. You should then get a pop-up window from Formstack asking you to log-in to authorize the connection between that Formstack account and Zapier. Clicking the green "Authorize" button will bring you back to your Zap. 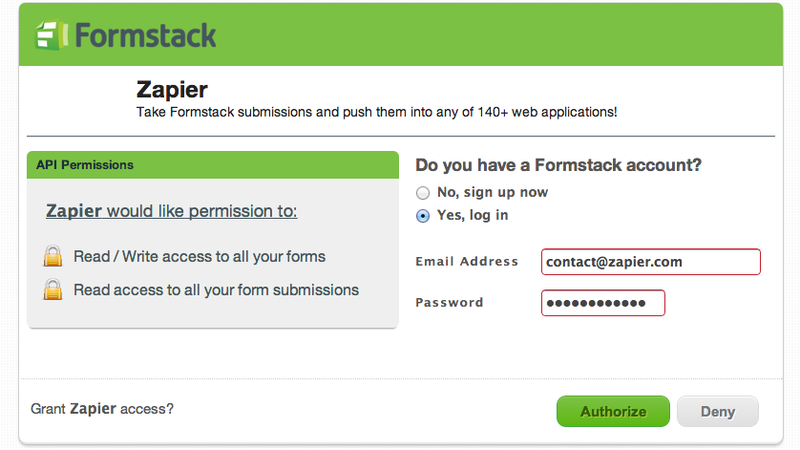 Logging into Formstack and authorizing finishes the process! Your Formstack account is now connected to Zapier. This is a really common problem that happens quite often. Formstack doesn't allow any 3rd party integration on plans below Silver. So if you're on a free plan and try to use the Formstack integration, nothing will come through. Double check that you have an appropriate plan. If you do, the next thing would be to set up the zap, skipping "Load Sample Data" and enable it. Now go to the form in Formstack and look under Settings -> Emails & Redirects -> After the Form is Submitted and double check that a Zapier URL has been added. If you make a copy of a form in Formstack, it also copies any existing webhook integrations, like to your Zap. Click the red delete icon over to the far right, which will delete the integration for this form.